It looks like someone at Carphone Warehouse hit “activate” on their website a little bit early. 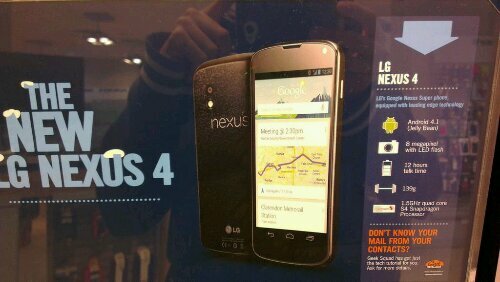 They have published the upcoming LG Nexus 4 has popped up on their website. Available for free from £31 per month on either Vodafone or O2. They haven’t published any specs yet, although it does mention Android 4.2 as being Jelly Bean. The rest seems fairly expected. Head over to the link below quick before they pull the page. Update – Here it is in store, complete with Android 4.1 Jelly Bean..